Java Installation Error Solution: "Error applying transforms"
Recently, I needed to upgrade Java on my computer so it would run the latest software programs, but when I tried to install Java, I received an error message that said: "Error applying transforms. Verify that the specified transform paths are valid." 1. First, uninstall the current Java runtime that you have. 2. Next, download the offline version of Java. Try to install it, but if it still doesn't work, move on to the next step. where User is whatever username that you chose for your computer and jre1.6.0_06 is the name of the Java version that you want to install (currently version 1.6). 4. 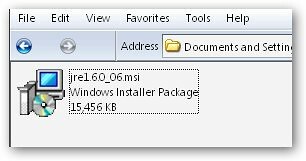 You should see a Windows Installer Package file (.msi) in the folder, Just double-click on the installer to install Java with no problems.